For search engine optimization, Web analytics is the backdrop of all initiatives. Web analytics is the collection, analysis and reporting of Web usage data. As such, Web analytics is the means of gauging SEO success. 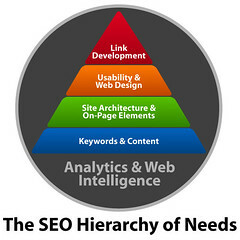 It is for this reason that Web analytics takes its place in the SEO Hierarchy of Needs as the required backdrop of all SEO efforts. As the SEO Hierarchy of Needs series comes to a close, we have reached the final installment: analytics and Web intelligence. Much has been said about the science and practice of Web analytics, and here you'll find three notable resources that are useful in the daily on-site work of an SEO. The first reflects the unique place of Web analytics in the larger context of Internet marketing. Next, thought leaders have introduced a new framework for analytics on the evolving Web. Finally, an SEO can apply lightweight yet powerful analytics resources to measure day-to-day search engine optimization efforts. With an understanding of the context, framework and tools of Web analytics, a search marketer can see the larger picture of how Web analytics fits into the strategy and responsibilities of SEO. The role of a Web analytics specialist stands separate from that of an SEO; however, there is some notable overlap. The end goal of search engine optimization is to achieve high search engine rankings based on a Web page's targeted keywords. The end goal of Web analytics aims to transform traffic to a Web site into converting customers. High search engine rankings typically lead to high traffic volume. High traffic volume can translate into a higher number of converting customers. While SEO efforts feed into conversion optimization efforts, the two are distinct practices in Internet marketing. In Why Conversions Can Be a Messy SEO Metric, Internet researcher and community leader David Harry argues that confusing the role of an SEO and the role of a conversion rate optimizer (CRO) or Web analytics professional can cause damage to both practices. The daily tasks of an SEO include keyword targeting, SERP rank monitoring, Meta data optimization and link building - factors that directly influence search engine rankings. A CRO is responsible for overseeing customer service, incentives, ongoing testing and page tweaking, calls to action, and usability - areas that directly affect the likelihood of conversions. It's not uncommon in the search engine optimization industry that other Internet marketing fields, such as social media marketing and conversion rate optimization, get combined with the goals and tasks of SEO. At the same time many Internet marketers are seeking to expand their areas of expertise in order to keep their knowledge offerings competitive and their skill offerings indispensible. While this strategy may be beneficial to the marketer, at least in the short term, it is important to maintain understood boundaries between fields so that time, resources, and responsibilities are properly allocated to each. By losing the distinction between these practices, Internet marketing professionals risk watering down their efforts by taking on too many disjointed tasks or by failing to create mature strategies for each. Certainly, Internet marketing has seen continuous adaptations in tandem with the evolution of online technologies and user behavior. In response to the changing online landscape, Web analytics thought leaders have proposed a new model for measuring objectives on the increasingly social Web. The pioneering concept was introduced by Avinash Kaushik and Daniel Waisberg in a paper published in the search marketing industry's peer-reviewed academic journal, SEMJ.org. The paper, Web Analytics 2.0: Empowering Customer Centricity - Part II (pdf), explains how to measure consumer engagement by paying attention to micro-conversions, which include important but often overlooked metrics. "We tend to obsess, perhaps a bit too much, about the main purpose of the Web site. The average conversion rate in the United States for the top retailers is something around two percent. And so if you think about it, you spend your entire life, I spend my entire life, focusing on trying to think about what two percent of the outcomes are, and only focus or obsess about two percent. I think what's very important for people to do is figure out what is important about the other 98 percent of the people who never convert on your Web site, whether you're an e-commerce, non-profit, or for-profit Web site. We should not simply focus on the two percent. We should figure out, what are all of the other jobs that a Web site is trying to do, and then figure out how we're doing in terms of all of those other successful criteria. For example, I met some executives from Nordstrom yesterday in Seattle, and I said to them, you know for Nordstrom.com I will measure, absolutely, what the big objective is, which is to get orders from people who come to our Web sites. Right? That's done deal. We're going to do that. But, why don't we also measure how many people apply for a Nordstrom credit card; how many people sign up as leads for our e-mail campaigns; how many people create wish lists on Nordstrom.com; how many people, as a result of visiting our Web site, friend us on Twitter and Facebook; how many people do X, Y, Z; how many people sign up for personal shoppers in stores; how many people printed directions to our map? So you can see that Nordstrom.com Web site is trying to do 10 different jobs for people who come to its Web site. And yet, most of the success is simply measured by number of orders placed. I'm not saying that's not important. I'm saying if you don't measure the secondary objectives, you're not measuring the holistic success of your Web site." The model for Web analytics is shifting, and Web analytics analysis is distinct from search engine optimization. However, that doesn't mean that SEOs should wash their hands of analytics data altogether. Obviously, Web intelligence and data are extremely useful for measuring the success and refining the efforts of search engine optimization. The following tools and resources are straightforward, relatively simple and directly support SEO efforts. Ian Lurie's Google Analytics Cheat Sheet (pdf): While the information represented in this cheat sheet is far from an exhaustive guide of the tools available through Google's free analytics platform, the cheat sheet includes the basic analytics necessities of an SEO. Lurie explains that the cheat contains all the info he would want his own staff to use, from setting up Google Analytics to a list of the bare minimum GA features an SEO should be familiar with. VKI Solution's Complete Google Analytics Power User Guide (pdf): If an SEO wants to dive deeper into the capable feature set of Google Analytics, this power user guide is a good place to start. The Google Analytics Cheat Sheet is a two-page PDF covering the bare bones of GA. This 45-page resource covers many more tools and walks readers through each, explaining the context for use and step-by-step instructions. Measuring Engagement Goals with Google Analytics: In October of 2009, enhancements to Google Analytics were announced. As part of the update, engagement goals were added as a new goal type that could be measured through the Google Analytics platform. Metrics that fall under that category of user engagement often represent micro-conversions, which are especially relevant in light of the Web analytics 2.0 framework proposed by Avinash Kaushik and Daniel Waisberg. Likewise, the addition of goal sets and goal funnels will help SEOs better track and understand the overall success of a site.